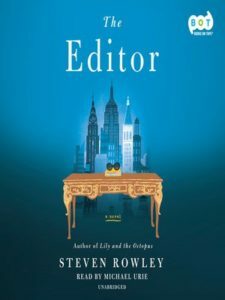 THE EDITOR. By Steven Rowley. Penguin Audio. Read by Michael Lee. 10 ½ hours. 9 CDs. $40. Also available in print from G. P. Putnam’s Sons. What an original and wonderful idea for a book: James Smale is a struggling would-be writer in New York City in the early 1990s, when, at last, an editor at a major publishing house wants to buy the novel he’s worked on for so long. When he goes to his first appointment at the publishing house, he is shocked – flabbergasted wouldn’t be too strong a word – to learn that the editor who wants to acquire his book and work with him to revise it is Jacqueline Kennedy Onassis. Jackie, as James calls her when he’s not actually with her (in person, she’s Mrs. Onassis), is impressed with James’ largely autobiographical novel, in which he describes a version of his own dysfunctional family, particularly his troubled relationship with his mother. But Jackie thinks James has shied away from writing a true ending, and she’s determined to push him to deal with things more honestly and fully. What ensues is an entertaining, often humorous, and richly insightful story about more than one kind of relationship, about secrets and the power they hold – about the complexities of love, family and life. Steven Rowley made it big with the bet-selling novel Lily and the Octopus, which I have not read but intend to. Reviews of that book call it funny, wise and wholly original, and all those adjectives can be applied to The Editor. The whole idea of a young, insecure gay man developing a relationship with perhaps the most famous and adored woman in his world is without a doubt unusual, and it is also deeply affecting. Jackie is pushing James, we gradually see, to deal fully with his relationship with his real-life mother as well as to write a strong ending for his novel. She’s Jackie O, sure, but she’s also a mother herself, and a woman who was once an idealistic girl, and a skilled editor who knows and values good literature. And James is believably funny in his honest narration of his reactions to “Mrs. Onassis” as well as to the other relationships and events complicating his life. The problem with following Jackie’s advice and creating an authentic, powerful ending for his novel is that it’s likely to further estrange him from his mother. Making matters worse, his struggles with the book, and the effects they have on him, are causing problems with his partner, Daniel. Along with James, we see his developing relationship with Jackie deepen in a way that will affect the rest of his life. And we see him navigate the complexities of his relationship with his mother, who sheltered and pampered him, her youngest and most unusual child, but now is decidedly not happy with what he’s writing about her – and the uncomfortable truths he’s going to uncover. The audio version is doubly entertaining, as Michael Urie does an excellent job of voicing the characters, including James, his mother and the lovely Jackie O. This entry was posted in Audio Books, Contemporary literary fiction and tagged Jackie Onassis, literary fiction, Steven Rowley, The Editor. Bookmark the permalink.